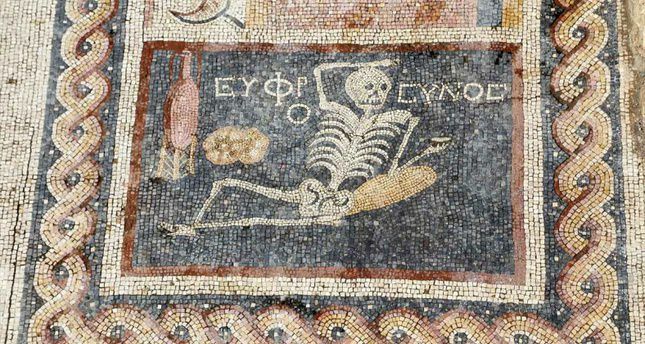 A 2,400 year-old mosaic discovered during excavations in Turkey's southern Hatay province, showing a skeleton lying down with a jorum in his hand and a wine pitcher and bread on the side could be one of its kind, Turkish researchers have said. 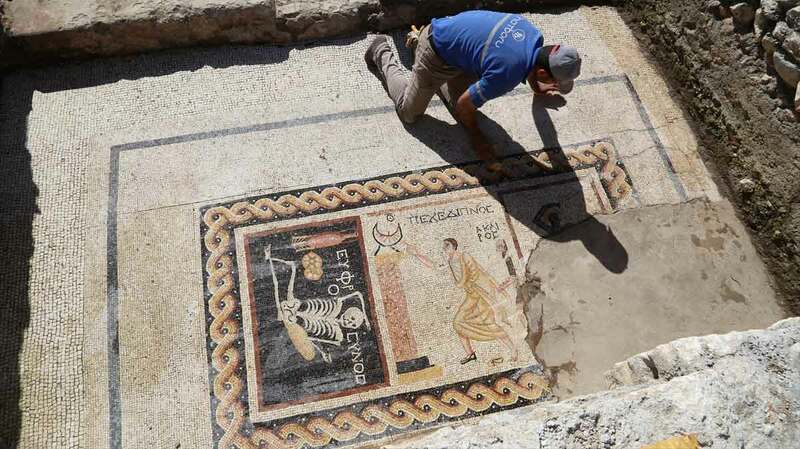 The mosaic, which is reportedly from the 3rd century BCE, was first discovered in 2012, when municipality was carrying out work to build a cable car in Antakya and found ancient remains. Excavations were then launched to search the area for more remains. Kara further noted that professors have referred to the mosaic as the 'skeleton mosaic' and have concluded that the mosaic belonged to the dining room of a house belonging to the upper class back then. She noted that there is a similar mosaic in Italy, but this one is more comprehensive, making it a unique piece. The ancient city of Antioch was established by Seleucus I Nicator -who is one of Alexander the Great's generals- in the 4th century BCE. It is known to be the first place where the followers of Jesus were referred to as Christians. Hatay is known for its Roman-era mosaics dating back to the second and third centuries BCE.